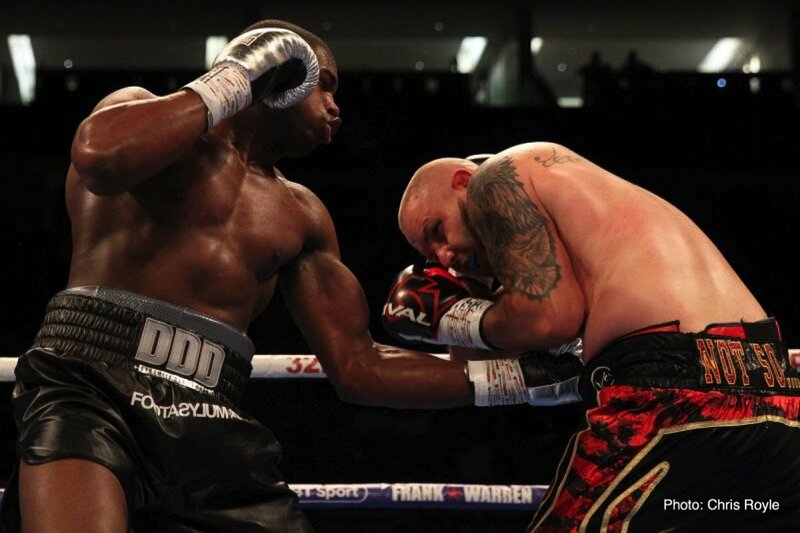 An interesting age Vs. youth heavyweight match-up will take place tomorrow night in Leicester, UK, as red-hot unbeaten prospect Daniel Dubois faces veteran Kevin Johnson. On paper, this is the 8-0(8) hope’s toughest test to date and fans along with experts are interested to see how the 21 year old does against the 39 year old who has been in with everyone from Tyson Fury to Anthony Joshua. A lot will have to do with how much ambition “KingPin” carries these days, and we may have got a good idea from the weigh-in, which took place earlier today. Johnson really does look to have worked hard, his condition looking good, a trace of a six-pack even visible. Johnson has never been what you could call ‘ripped,’ but he did look in fine physical shape today. So too did Dubois, as was expected. Johnson, looking thick and muscular, tipped-in at 18st 4lbs or 256 pounds, while Dubois came in at 17st 1lb or 239 pounds. Johnson, 32-10-1(16) and stopped just twice during his nearly 16-year pro career, told the gathered media how he has put half the amount of his purse on himself, so sure is he he will defeat the young and as yet untested (at top level) Dubois. For his part, Dubois says he can’t wait to display all the new things he has been working on in the gym. It does look like being an interesting fight. Dubois has yet to be extended beyond the fifth round and there are still questions about his stamina should he need to go the full ten or 12 rounds. Johnson, no big puncher but a tricky customer who knows his way around a ring (he went the distance with Vitali Klitschko, Dereck Chisora and Fury), may well take Dubois into unfamiliar territory tomorrow night. Johnson says he feels he has around six more fights left in him before he retires, and maybe he will make the most of this, possibly his last big chance. Dubois is the pick to win of course, but we could find out quite a bit more about the unbeaten power-puncher before he gets his hand raised. Judging by his physical appearance, Johnson – who said a while back how the sad passing of his father has given him fresh motivation (a Buster Douglas-Mike Tyson situation perhaps? Buster using the death of his mother to motivate him like never before that day in 1990) – has indeed worked hard for this fight.